Yeoval Roll of Honour commemorates former pupils of the school who served in World War One. The roll was unveiled at the Memorial Hall in 1953. Additional names were added to the roll in 2015. The Memorial Hall roll replicates the original Honour Roll of cedar which was unveiled at the school in 1918. "Communists, with their headquarters in Moscow , are putting into effect a three-phase plan which aims at the complete social destruction of the democratic world," said Lieut.-Colonel J. M. Prentice in an address at Yeoval on Anzac Day. Colonel Prentice, with the President of the Wellington R.S.L., Colonel N. D.Barton were guests of the Yeoval sub-branch of the R.S.S. and A.I.L.A for the Anzac memorial ceremonies. Colonel Prentice addressed a capacity crowd of over 500 which packed the Yeoval Memorial Hall for the Anzac memorial service, and Colonel Barton unveiled two memorial plaques on which were inscribed the names of Yeoval men and women who had served during two world wars. Mr. L. C. Wykes, President of the Yeoval R.S.L., welcomed Colonels Prentice and Barton and said how honoured the branch was to have their company. After the address by Colonel Prentice, Mr. A. Marshall Brown, as a member of the public, gave a short address in which he said that now the plaques were installed, the hall was fitting as a memorial to those who served in both wars. Ex-servicemen's representative, Mr. J. D. Black, said that the memorial would not have been possible without the marvellous generosity of the Yeoval citizens. "This is a very fine hall and we are very proud of it," he said. Mr. Wykes then called on Col. Barton to unveil the plaques. Col. Barton then unveiled the plaques. As he unveiled each plaque, he said the words: "May these names be ever held in proud remembrance." The National Anthem was then sung. Excerpt from the Wellington Times (NSW), 4 May 1953. 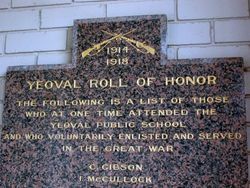 The first Yeoval Honour Roll was unveiled in October 1918 with 21 names. However, it was stated at the time, that four other soldiers were to be added. 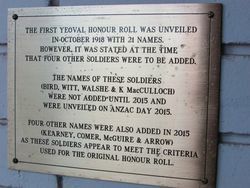 The names of these soldiers (Bird, Witt, Walshe & K MacCulloch) were not added until 2015 and were unveiled on ANZAC Day 2015. Four other names were also added in 2015 (Kearney, Comer, McGuire & Arrow) as those soldiers appeared to meet the criteria used for the original honour roll.